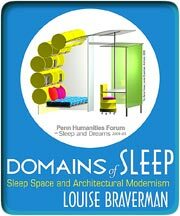 As part of University of Pennsylvania's Humanities Forum on "Sleep and Dreams," architect Louise Braverman will present "The Domains of Sleep: Sleep Space as a Blueprint for Understanding Architectural Modernism." Put simply, the lecture will illustrate the history of modernism by focusing on the most intimate of spaces  the bedroom. But why bedrooms? "Everybody sleeps somewhere," says Braverman. Sounds obvious, but this truism is what makes her lecture accessible. No matter where we've experienced it, sleeping is part of our daily routine, and the bedroom is where we're at our most comfortable. By "using the familiar to discuss architecture," Braverman hopes to establish "bedrooms as an index of how modern architecture has evolved in the past 100 years." She notes that such a guide to architectural history isn't readily available: "A lot is written about 20th-century architecture, but domestic spaces are overlooked. This exploration is fascinating to me." Known for her conceptual designs of ideal spaces (such as her 2003 Barrel House, pictured) and her award-winning plans of low-income housing in New York, such as the Chelsea Court, Braverman will discuss several examples of sleep spaces, including college dorms, nap capsules and beds used throughout the 20th century. Such examples are intended to evoke the dynamic between sleep spaces and the architecture of the past century: "Domestic spaces can reflect the industrial. Bedrooms can reflect the architecture of skyscrapers," she says. Which is fitting, since Braverman notes that you can actually rent a futuristic nap pod in the Empire State Building. But at $14 for 20 minutes, they must be dreaming. "The Domains of Sleep," discussion with Louise Braverman, Wed., Jan. 26, 5 p.m., free, Meyerson Hall, Room B1, 210 S. 34th St., 215-573-8280, registration required.